Apterae of Cinara pini are grey or greyish-green with black markings, and with either a slight bronze iridescence or a dusting of grey wax. The abdomen is wax powdered along the dorsal midline, along the segmental borders and laterally (see first picture below) (cf. Cinara nuda which has the dorsal body devoid of wax, very shiny and uniformly dark brown; and cf. Cinara schimitscheki which is uniformly wax-dusted, with four rows of black spots). 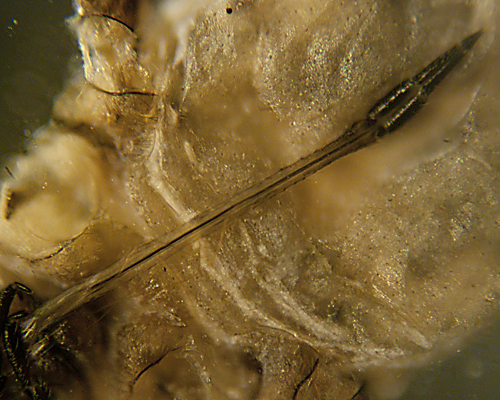 Dorsal hairs on the abdomen are sparse and very short, mostly 0.01-0.04 mm. (cf. 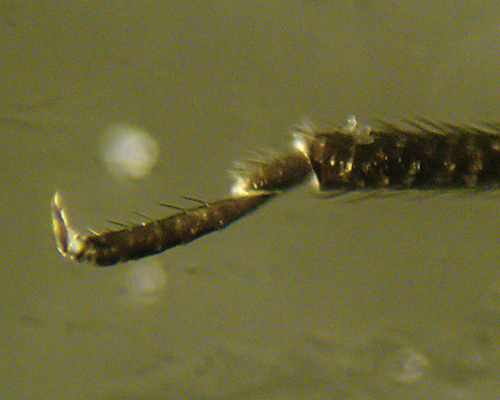 Cinara acutirostris which has several rather long hairs, up to 0.1 mm long, between the siphuncular cones). The length of the first tarsal segment (HTI) (see first micrograph below) is less than 0.5 times the length of the second tarsal segment (HTII) (cf. 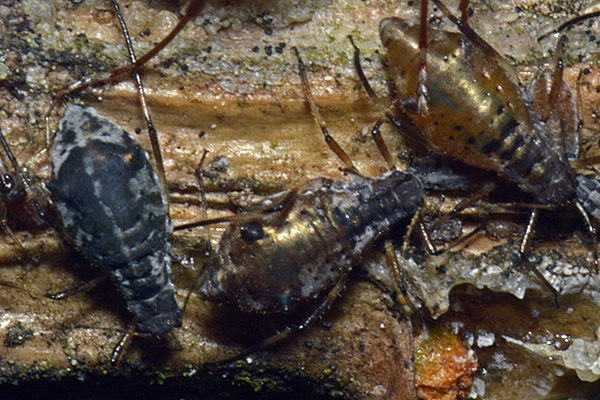 Cinara schimitscheki, Cinara pinea and Cinara pilosa which all have HTI more than 0.5xHTII). The length of the two terminal segments of the rostrum of Cinara pini is less than 1.2 times the length of HTII. Lastly the sclerotized part of the stylet groove (see second picture below) is 1.2-1.5 mm long and there are only 4 subapical hairs on the antennal terminal process (cf. Cinara nuda where the sclerotized part of the stylet groove is 1.8-2.2 mm long, and there are 4-7 subapical hairs on the antennal terminal process). The siphuncular cones are black and prominent (cf. Cinara pinihabitans which has low and rather inconspicuous siphuncular cones). 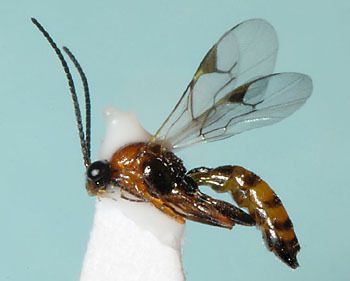 The body length of an adult Cinara pini aptera is 1.9-3.7 mm. The first micrograph below shows the hind tarsus (HTII & HTI) of Cinara pini; the second micrograph below shows the rostrum of Cinara pini. 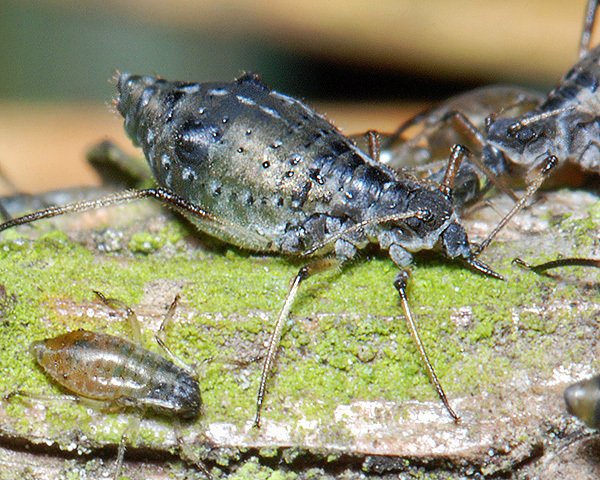 The first micrograph below an adult aptera of Cinara pini; the second micrograph below shows an alate of Cinara pini, both in alcohol. 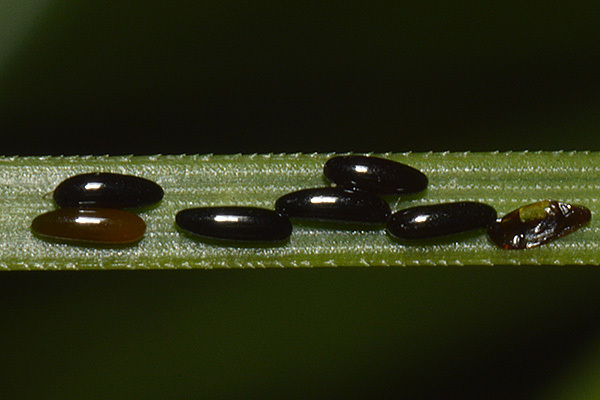 Cinara pini eggs are laid in lines of 2-5 eggs along the pine needles. 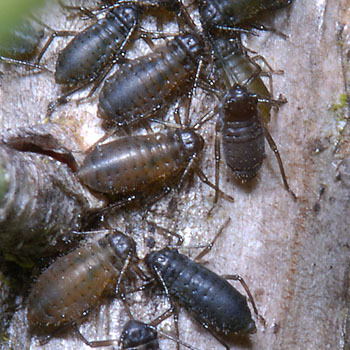 These eggs hatch in March and the emergent nymphs then feed on the bark of young branches or on growing shoots of young trees, as can be seen in the pictures below. Larsson (1985) looked at the within-tree distribution of Cinara pini on Scots pine trees throughout the growing season. These aphids were aggregated on the young internodes in the top parts of the crown during early summer, and on the older internodes in the lower parts of the crown during late summer. 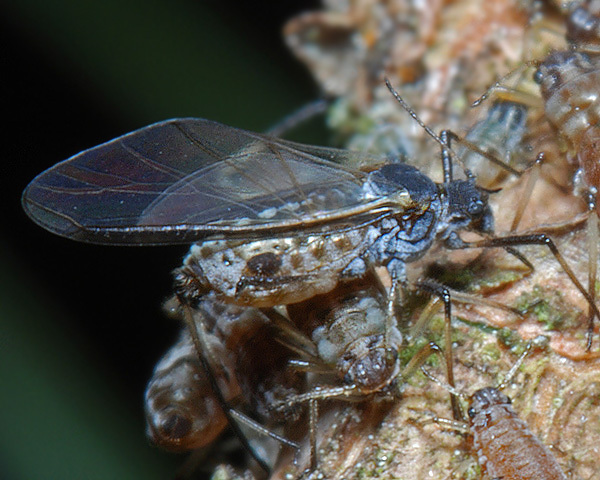 Seasonal changes in aphid distribution patterns were related to the changes which take place in the phloem sap of Scots pine during the course of the growing season. 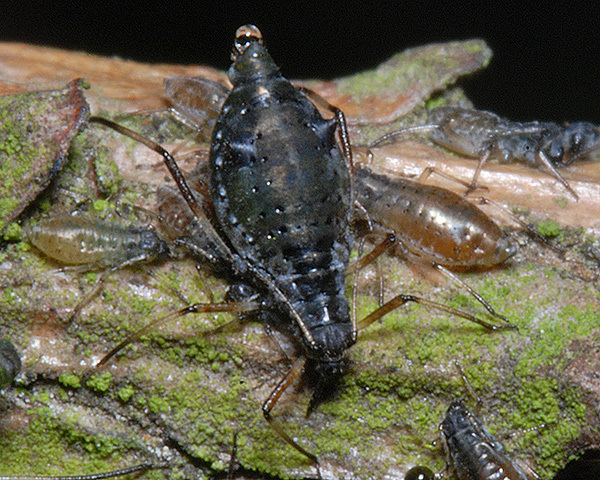 Oviparae and males develop in the autumn. All stages of this species tend to be highly variable (Fossel, 1972) both in markings and overall colour. The first picture above shows two of the main colour forms of the Cinara pini adult, which range from an iridescent bronzy-green to light grey. 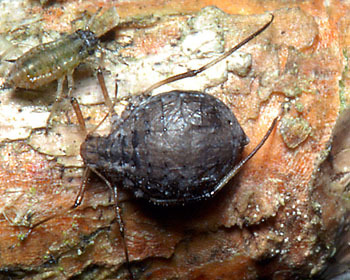 The image above shows an darker grey adult aptera exuding a droplet of honeydew. 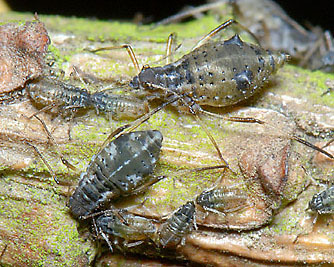 The aphids (above) were found in different locations, Ashdown Forest in East Sussex and Bedgebury Pinetum in Kent, but show the same cryptic coloration of brown marked with white wax, which often matches the bark colouration. The image above shows the light grey form again, along with a more orange version of the cryptically coloured form. The image below shows a very dark form. 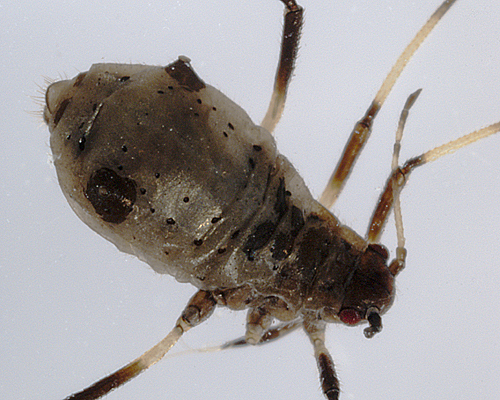 The Scots pine aphid is avidly attended by ants and is regarded as an obligate myrmecophile. 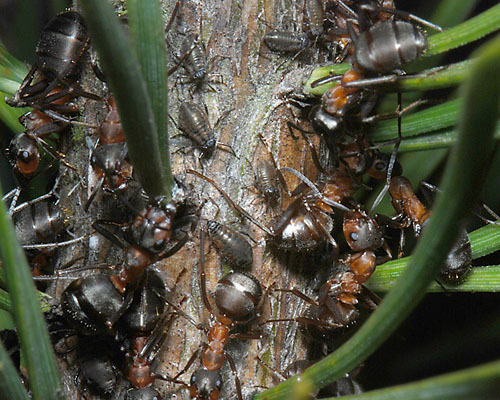 The first picture above shows southern wood ants tending a colony of Scots pine aphids. The second picture shows a wood ant in full defensive posture. Bauer-Dubau (2000) studied populations of Cinara pini on Pinus species. in a botanical garden in Berlin, Germany. It was the was the most common aphid species on Pinus and was constantly and heavily attended by the ant Lasius fuliginosus, with up to 50 ants per colony. We have also noted the unusually large number of ants attending these aphids, often with more ants than aphids! (see picture below). 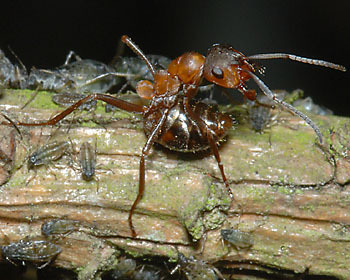 Bauer-Dubau found that the number of offspring produced by Cinara pini was higher when attended by ants. If not ant-attended, the anuses of these aphids become covered with honeydew and colonies dispersed. 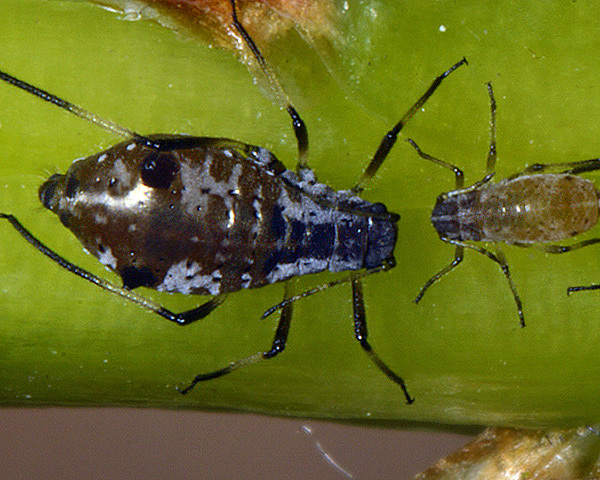 Despite the near-ubiquitous presence of ants, colonies of Scots pine aphid are still attacked by natural enemies, especially aphid parasitoids. Slawinska & Jaskiewicz (2005) found a range of predators present in Lublin, but felt they were too few to have much impact on aphid numbers. 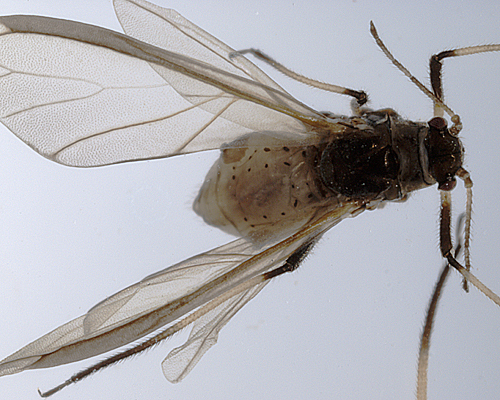 Only one primary parasitoid (Pauesia picta) was present, although there were several species of hyperparasites. We have found several parasitoid mummies, one of which is shown in the picture below. This also proved to be a Pauesia species, as shown in the second picture below. Völkl & Kroupa (1997) looked at the effects of adult mortality risks on parasitoid foraging tactics. 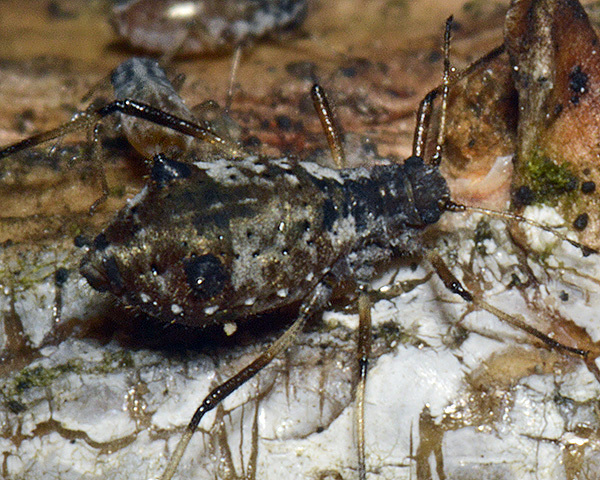 When searching on Scots pines, females of the aphid parasitoid Pauesia silvestris foraged more successfully on the pine aphid Cinara pini than on Cinara pinea. However, the parasitoids suffered from a high mortality (19.5%) from ant aggression when foraging for Cinara pini while mortality was zero on pines with Cinara pinea. 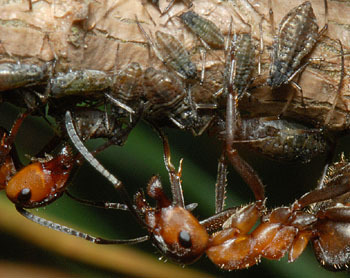 All females that were killed were foraging on the bark, while females searching on needles were safe from ant attacks. When searching for Cinara pinea the parasitoid spent significantly more time on needles if the aphid colonies were ant-attended. On pines with Cinara pini in contrast, females spent more time on bark in ant-attended colonies. The high adult mortality risk on bark was counterbalanced by a significantly higher foraging success in ant-attended colonies. Cinara pini has been recorded from at least 10 Pinus species (Pinus banksiana, Pinus cembra, Pinus halepensis, Pinus mugo, Pinus nigra, Pinus pinaster, Pinus pinea, Pinus ponderosa, Pinus sibirica, Pinus sylvestris). Blackman & Eastop list 30 species of aphid as feeding on Scots pine (Pinus sylvestris) worldwide, and provide formal identification keys. 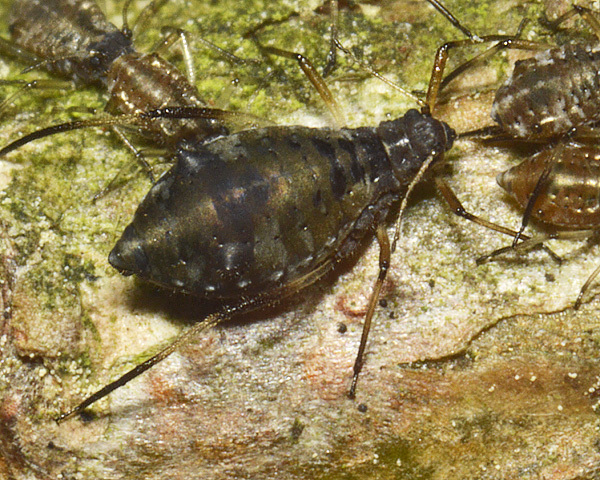 Of those aphid species, Baker (2015) lists 15 as occurring in Britain: Cinara brauni, Cinara nuda, Cinara pilosa, Cinara pinea, Cinara pini, Cinara pinihabitans, Essigella californica, Eulachnus agilis, Eulachnus brevipilosus, Eulachnus rileyi, Pineus orientalis, Pineus pini, Pineus strobi, Prociphilus pini, and Schizolachnus pineti. No detailed work has been done on the effect of Cinara pini on pine but there are few visible signs of damage. Nevertheless Jaskiewicz (2005) suggests that heavy infestations can lead to a general weakening of the plant. 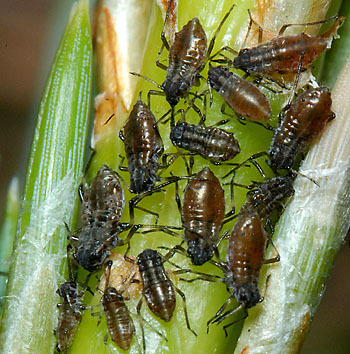 However, aphid infestations benefit honey producers since bees feed on the aphid honeydew. We especially thank Trees for Life and the UK Forestry Commission Bedgebury Pinetum for their kind assistance, and permission to sample.